NEW YORK, NY—Last night, NBA Commissioner David Stern announced a controversial change to this year’s All-Star Weekend: instead of the Haier Shooting Stars competition, the Sprite Slam Dunk will be preceded by a game between the Eastern and Western Conferences’ most overpaid players. The change has concerned some league investors, citing that exposing how bloated some player contracts are will upend the league by demonstrating that some General Managers have absolutely no sports business acumen. But Stern trusts that this game will be a positive new addition to the league’s mid-season extravaganza. 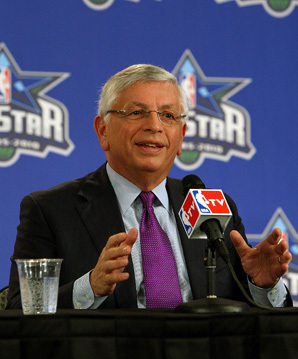 Commissioner Stern demonstrates the amount of cash teams will save thanks to this game. “The All-Star Weekend is a time for renewal for the league, especially for the players. Giving select players the opportunity to reassert themselves as stars in this league can help them demonstrate to fans all over the world that they deserve every penny they’re paid,” Stern said with a sly grin. The rosters for the HSBC Contract Classic (shown in full below) consist of a range of NBA talent, including former all-stars (e.g. Rashard Lewis, Vince Carter), players who have made little to no contribution to their teams (e.g. Eddy Curry, Luke Walton) and players who are essentially being paid to not be on the team (Marco Jaric).